Massachusetts' highest court reinstated Aaron Hernandez's 2015 murder conviction Wednesday doing away with the legal principle that made the former New England Patriots star innocent in the eyes of the law after he killed himself in prison. 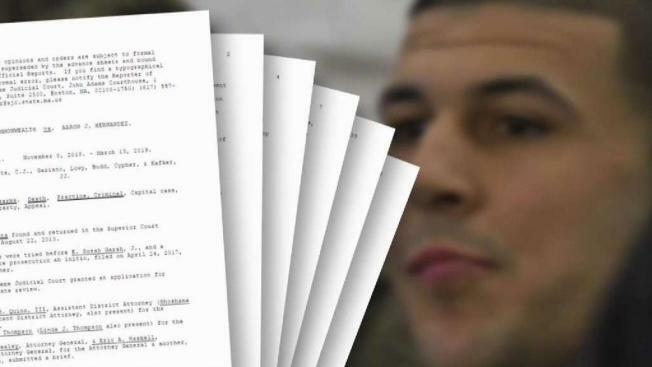 Attorneys for the late Aaron Hernandez are asking Massachusetts' highest court to reverse its decision to reinstate the former New England Patriot's murder conviction. The lawyers say in documents filed Friday that the Supreme Judicial Court got it wrong when it ordered last month that Hernandez's conviction be restored. Hernandez was found guilty in 2015 of killing semi-professional football player Odin Lloyd. The Supreme Judicial Court's decision did away with the legal principle that erased Hernandez's conviction after the 27-year-old killed himself in his prison cell in 2017. The court said convictions in such cases will now stand. It applied the new rule to Hernandez's case, but no other prior cases. Hernandez's lawyers say the new rule should impact only future cases, not Hernandez's.